Local volunteer fire fighter Leon King agrees to repair his ex-girlfriend Susie Bontrager’s grandparents’ antique rocking chairs for her future home with her fiance and is forced to acknowledge that his feelings for her have not quite gone away. As Susie spends time with Leon, she begins to recognize she is marrying the wrong man for all the wrong reasons. For the past two years, Shane Broyles has felt God leading him to join the Amish. He’s staying with his friends Noah and Ivy Schlabach in Birch Creek, OH, where he is reunited with Lucy Fisher, an old friend of Noah’s family. Shane and Lucy have never revealed their feelings for each other, but when they stumble upon an antique Bible at a flea market, they feel drawn to each other and to the mystery of the contents found within. I really enjoyed these four stories written by some of the best Amish authors out there. A Legacy of Love by Amy Clipston, The Cedar Chest by Beth Wiseman, The Treasured Book by Kathleen Fuller, and The Midwife’s Dream by Kelly Irvin will fill many hours of entertainment for you. Each of these stories have difficult situations, but with each, the author weaves the difficulties together within the lives of these characters and gives us a story that will warm our hearts. I have grown to love these collections of short stories because sometimes I just want to get away for a few hours with a heartwarming story that will make me forget life for a while. And these stories are just the medicine I need. If you love Amish stories, you need to check out An Amish Heirloom for that special getaway for yourself. You will be so glad you did! I highly recommend this book to everyone who wants a nice clean read! If I Live by Terri Blackstock. I’ve been waiting to read this last book in this series. Casey has been running for a long time, through a lot of disguises, will it ever end for her? And if so how? If I Live is a fast paced thriller that you will not want to put down. I only put this book down when I absolutely had to, because I had to find out what was happening. The as in the other books, the characters are amazing, I feel like I know them in real life by now. The author has a unique way of describing each scene in the book with vivid descriptions that will have you on the edge of your seats. One thing I will say is that it is better if you read all three of these books in the series in order, because you get the plot of the story so much better. If you are looking for a story full of action, this one is for you! When Hosea Behr thought he was making the right decision when he uprooted his family and moved his family to an isolated Amish community in Upper Peninsula of Michigan. But his troubles started when the house he purchased, sight unseen, was a house of horror. Gabe Lapp had the shock of his life when he wakes up in the middle of the night to find an Amish family taking over the house he lived in with the Zooks. But he sure liked flirting with the daughter, Green eyes! Firestorm is the best from Laura Hilton so far! Of course that’s what I say about each of her new books! I love that Ms. Hilton’s Amish stories have a different twist than other Amish stories. And I love that she always writes the Gospel into each of her stories, and it’s done in a neat way that’s not ‘preachy’ at all. From the first page of Firestorm, I was just plain hooked! The books starts off when the Behr family arrives at their new house, after dark, and as Bridget says, ‘It’s a nacht-mare!’ The only thing good about this night was meeting the flirty guy in the lime green pajama pants. Maybe daylight would find the house in better condition, but it didn’t happen. And thanks to pajama pants man, who’s name is Gabe, he rounds up a huge tent and an RV for the family until something could be decided about the house. But as the story goes, nacht-mare after nacht-mare happens. Was moving really the right decision? This awesome story is full of character I grew to love, with the exception of Hosea that is. He was a high tempered and manipulated man, one that couldn’t manipulate Gabe, though! And I loved Gabe and Bridget, and the chemistry between the two. And Gabe kept me first laughing and crying throughout the story! And Gabe’s dad the preacher and the Bishop were pleasant Godly men who succeeded in keeping Hosea in check. If you haven’t read a Laura V. Hilton book, Firestorm is a great book to start with! I know you will find this story as captivating, intriguing and entertaining as I did! I received this book from the author and publisher to read and review. I was not required to write a positive review. The opinions I have expressed are my own. I am disclosing this in accordance with the Federal Trade Commission’s 16 CFR, Part 55. What an special sweet story. We don’t read a lot of fiction about children with special needs, especially in the Amish communities, which makes this story, well, just special. Author Rachel J Good does an amazing job writing this story, as well as the research about special needs children and the schools and environment they need to be in. Ada Rupp already had her hands full raising her seven siblings, and wasn’t sure she would be able to teach at the special needs school, but she soon found herself falling in love with one of her students. Nathan was a disturbed little boy but he seemed to trust his teacher, which was much more than how he was with his dad Josiah. All Josiah heard from Nathan was the screaming and screeching that came each time Josiah tried to do anything for his son. Can Nathan one day give Josiah the love and trust he gives his teacher? I felt so very bad for Josiah because everything he tried to do for his son just made Nathan worse. And to make matters worse, the more time Ada and Josiah spent together to more chemistry there was between them. And that couldn’t happen because Josiah was still in mourning for his deceased wife and no one wanted Ada because she had her family to take care of. But they still enjoyed each other’s company, despite the warning from the Bishops wife. That is until a newspaper reporter took pictures of the two coming out of the school alone, pictures that were printed on the front page of the English newspaper. Boy does this author have her work cut out for her! But Rachel Good does a fantastic job of weaving all of these difficult problems and situations together to make a really sweet story. I loved the main characters, Josiah and Ada and the attraction they had for each other from the first time they met. But as for much to nosey Bishop’s wife, I wanted to tell her a few things! All of the characters for the special children were heartwarming, but David and Nathan’s relationship was what touched me more than any of them. I loved the way these two learned to communicate with each other as if they were normal kids. And again Ms. Good does an amazing job with these and the rest of her characters. I felt connected to them all, and it felt like I was reading about real people with real life issues. I highly recommend this special book to everyone who enjoys a clean, entertaining read. And if you love Amish stories, this is one you don’t want to miss! 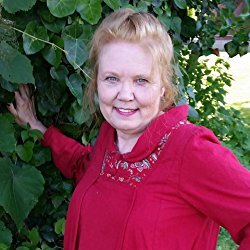 Rachel is the author of several Amish series in print or forthcoming – Sisters & Friendsseries, Love & Promises series, and two books in the Hearts of Amish Country series – as well as the Amish Quilts Coloring Booksand the contemporary novella, Angels Unaware, part of the Hope Chapel series. In addition, she has stories in the anthologies Springs of Love and Love’s Thankful Heart.